In late November, 2015, I met with the Chief Librarian of Charlottetown’s Confederation Centre Public Library, Ms. Trina O’Brien Leggott, to discuss the possibility of introducing a Library Telescope Loaner Program. The idea arose as I was looking for options for the Dobsonian telescopes I had left over from my Scopes for Schools initiative. I often wondered what avenue might be available to make telescopes available to the public. With no astronomy club existing in the area there were limited resources available. I thought about libraries but had no concept of how such an arrangement would work. By chance, I happened to be reading another article where a telescope loaner program was mentioned. A few Google searches brought me to the New Hampshire Astronomical Society web pages where I learned about what may be the most successful program of its’ type in the United States. After reading over their extensive history on this topic, and googling a few more web sites on library telescope loaner programs, I sent an email off to the NHAS group. They responded quickly and we exchanged a number of emails with me asking never-ending questions and them patiently providing answers and recommendations based upon their experience. Armed with a wealth of information I approached the local library with the idea. To my great satisfaction they were excited to pursue the concept, and so it began. 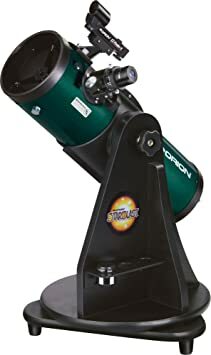 Rather than use the Orion StarBlast 4.5-inch Astronomical Telescope which is the preferred scope by the NHAS, I elected to use the six-inch SkyWatcher Dobsonians I had available. The NHAS modify the Orion telescope slightly and with the suggested changes the price of these telescopes would exceed the cost of the Dobsonians. Therefore, selling the Dobs and buying the smaller Orion’s was not an option. The advantages of using the Dobsonians is of course in aperture, 6 inch vs 4.5inch. Another advantage in my opinion is that the Dobs sit on the ground while the Orions are table-top telescopes. This in my view increases stability and places where it can be used. The main disadvantage is of course size and as a result, portability. While they are not heavy, the long tube and the assembled mount can be awkward for one person to transport, especially if wanting to move everything at once. Add a bag full of attachments such as finderscope and eyepieces, and resource materials like reference books and star maps, and you definitely have a two-trip move to bring everything to your observing site. The telescope was delivered to the library in early December with the understanding that work needed to be done to get everything in order before the telescope would be available for public access. We purchased a transport bag for the telescope and the library ordered a few recommended books which should help users find their way around the sky in any season. A lens pen was added to the supplies bag to facilitate basic cleaning of an eyepiece; and the library set to work to develop a set of guidelines for the program, based upon advice from some of the libraries in the NHAS program. Megan Glover, from the University of Prince Edward Island physics department joined the team and agreed to provide maintenance of the telescope and to develop a video to help new astronomers get acquainted to the Dobsonian telescope. That very good video, co-hosted by Megan and fellow Sidewalk Astronomer Chris Vessey is available below. I am optimistic the local population will make good use of the Library Telescope Loaner Program. If it has as much success as the NHAS program, I will be looking to add another telescope to their program. If you have used the telescope and have any feedback or comments, please drop me a note.